USQ Student Guild celebrated the re-launch of the Toowoomba Regional Tennis Centre – USQ last Friday, 5 August 2016. They were lucky enough to be joined by tennis legend and previous Davis Cup winner and team captain, John Fitzgerald, or “Fitzy” as he is affectionately known as. Among the other notable guests was Councillor Joe Ramia, Toowoomba Tennis Association President Allen Smythe, USQ Student Guild Board Chair, Neil Brown, USQ Student Guild Board President, Simon Playford, Executive Director Campus Services USQ, Dave Povey, Executive Director, SBMI USQ, Steve Ivey, as well as many supporting USQ staff members. It was a morning of fun on the courts with over 60 school aged children from across the region, enjoying Tennis Hot Shots activities with Fitzy giving them a helping hand on the courts. The kids were given “I love Tennis at CBRC” T-shirts which they wore with a smile. USQ Student Guild General Manager, Glenn Roberts, officially relaunched the Toowoomba Regional Tennis Centre – USQ, making a special mention to the founders of the centre – Queensland Government, Tennis Queensland, Toowoomba Tennis Association, Toowoomba Regional Council and University of Southern Queensland. He reinforced that the Centre is open to the general public and everyone is encouraged to use the world class facilities. The Toowoomba Regional Tennis Centre – USQ adds to USQ Student Guild’s facilities, making CBRC a high quality sporting precinct. The Centre now facilitates such sports as Tennis, Basketball, Netball, Futsal and Volleyball. The Tennis Centre relaunch was just one of the first steps in the USQ Student Guild rebranding process, with the CBRC’s official launch taking place in the coming months. 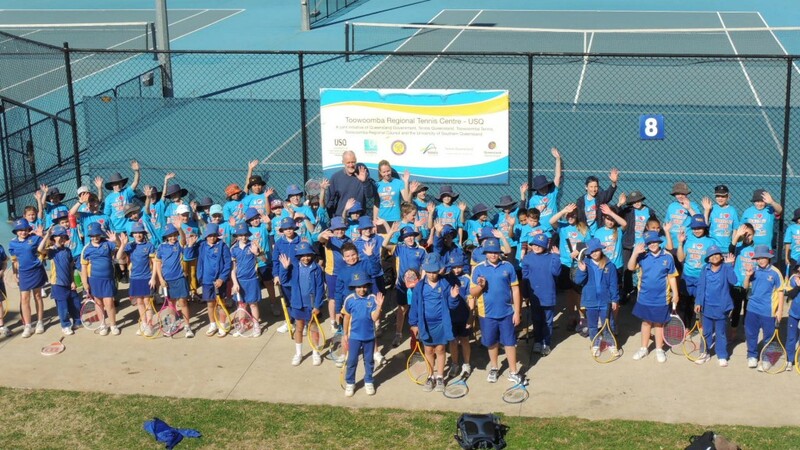 Toowoomba Regional Tennis Centre – USQ Relaunch: John Fitzgerald and Arlena Day with primary school students who participated in Hot Shot Activities.